PARTING WITH A WIDOW’S PEAK: You never really want to force a middle part when working with a widow’s peak. If it goes there, naturally then great. Otherwise, try going slighly (even just the tiniest bit) to one side or the other. When you split the hair right down the center with a widow’s peak, it tends to look thinner on each side. Better to thicken it up by going slightly off center. Look at Kourtney in the bottom center photo– it’s allllllmost center but she just pushes the widow’s peak piece over to one side. When you try to go straight down the center, one side typically behaves and the other refuses. Make mornings easier on yourself! DEEP SIDE PART WITH CURLS: I love this looks on a heart shaped face for two reasons. One, it does away with any parting issues caused by a widow’s peak. Two, it opens up the face and features the gorgeous jawline of a heart shaped face. Tuck the less heavy side and let the heavy side fall in front of your shoulders if your hair is long enough. HAIRCUTS: I would say the sky’s the limit for haircuts on a heart-shaped face. Almost anything looks great except heavy bangs or an jaw-length short bob. Short bangs can be really hard to control if you have a widow’s peak and if you have cowlicks on top of that, you definitely want to skip shorter bangs. BRAID AWAY: There’s not much more to this one than the fact that I think this is a super-cute look heart-shaped face girls. It’s a sweet, soft, feminine look that opens up your face. LOTSA LOOSE LAYERS: A piece-y blowout on hair with lots of layers is flattering on a heart-shaped face because it frames the face and makes the face appear a little more oval. 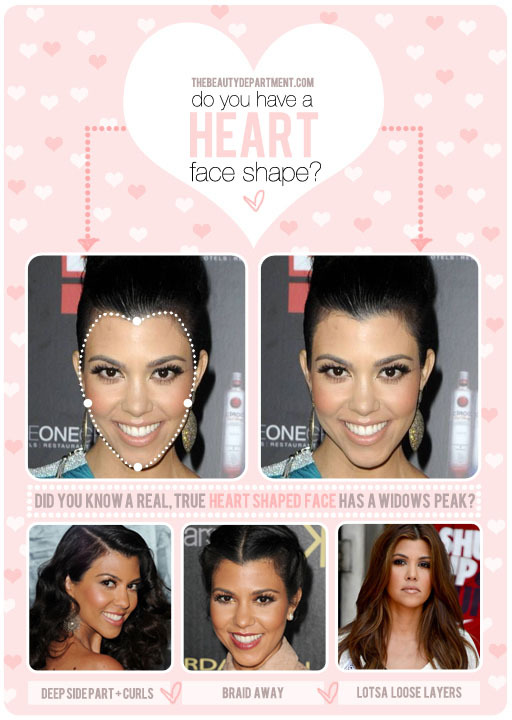 Look at Kourtney in the bottom right hand photo, the slight off center parting creates a more oval shape and diffuses the appearance of a widow’s peak almost entirely. UPDOS: Try a voluminous bun or pony. That will balance out the over-all silhouette of a heart-shaped face. Also, don’t go “too full” with your updos. When they’re wider than the hairline, they can actually make the chin look longer/more pointed.